← Boutiversary – the big 5 0! CCR v CRD Double Header! The 29th of March saw two epic bouts against a formidable opponent for CCR. Hailing from the depths of South London, Croydon Roller Derby travelled up to help CCR celebrate their 50th bout in style at a double header home event. Croydon’s A team travelled to Birmingham last season to take on CCR’s B team and took home a huge win, and were returning to face the A and B teams of CCR with an appetite for victory. The games displayed the hard work both leagues had put in since the last time they met and certainly made for exciting viewing for the fans! The CCR home teams took to the track looking slick in their new uniforms, courtesy of new sponsors Skate Hut, ready to lock wheels and get down to some serious derby. First up the B team saw CCR take an early lead in the first few jams with strong pack work and some healthy jammer performances, but Croydon were able to capitalise on an early power jam taking the points buffer away from the home league. The game saw a very tight score line for both sides with the lead score changing hands practically every jam. Some impressive defence from both sides made the game incredibly tense to watch and ended at half time with a score of CCR 75 – CRD 78. Back to business and both teams were hungry for the win. Some great jamming from both sides kept the fans on the edge of their seats with tight call offs and tactical play seeing a lot of hit it and quit it jams. A few traded power jams later in the second half and the period clock was fast approaching 0 with the score tied at 149 – 149 with 2 mins to go. After a fierce jam Croydon were given a power jam which was seemed destined to topple CCR’s victory efforts. With one final push and the crowd on their feet both teams skated their hearts out awaiting the final rolling whistle. Croydon had stolen the lead with seconds to go and managed to keep CCR at bay for a final score of CCR 162 – CRD 172. Next up was the A team game. Facing off for the first time neither team knew what to expect of each other. As an ex-Croydon skater myself I knew we were in for a physical and exciting game and we weren’t disappointed! The first few jams were close to call but CRD gained an early lead over CCR with a power jam. After shaking off the initial points deficit, the black and pink machine went to work seeing the physicality level ramped up to maximum on the CRD jammers. Regaining control of the scoreboard after a power jam in their favour, CCR continued to turn the screws on Croydon and were being met with all the fire power of the opposition blockers. Fierce battles for lead and points saw some hefty body blows being dished out from both teams with a few skaters even paying a visit to the front row fans. The score was sitting in CCR’s favour at half time but the game was far from finished. CCR 99 CRD 53. Both teams knew what they were facing in the second half with a determined Croydon side stepping up to try and shut down the points deficit. 2 jams into the second half saw some excellent blocking from both teams and CCR’s defence held the CRD jammers at bay to allow for some natural grand slams. The score gap continued to widen with Croydon digging deep and giving everything they had. 15 mins in to the second period the score stood at CCR 168 – CRD 59. An official review was called by Croydon to try and spring their jammer from the box but left the London side without a point scorer. The penalties began to sneak in for the CCR packs and jammers allowing Croydon to capitalise on some power jams, bringing them closer to the century mark. In the final moments of the game. Croydon’s President Garfield was left to lead the final charge on a CRD power jam and continued to fight to the final whistle. Final Score: CCR 232 – CRD 109. Well done to both teams for a great performance and a wicked event. We’d like to thank our sponsors Skate Hut, both teams, all of the officials and of course the fans for a great day and two very exciting games. 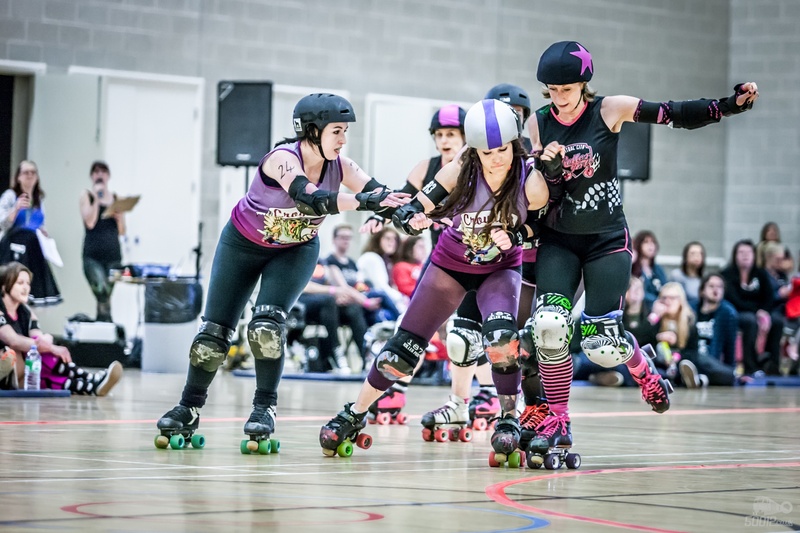 CCR A Team: Best Blocker – Woo-ha!, Best Jammer – Viv la France, MVP – Ghouldielocks. Photo’s courtesy of Phil Seymour and Floyd King Photography. Click on their names for more awesome shots! Want to see more? 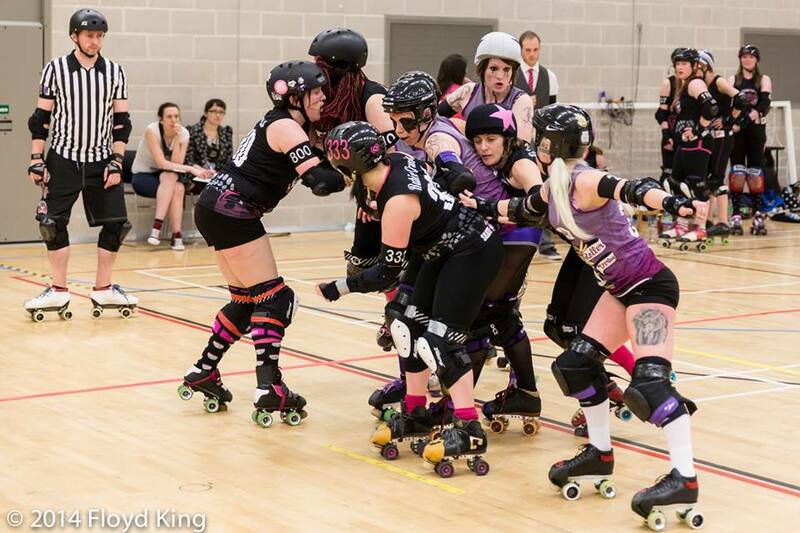 Join CCR on Sunday 4th May as we take on One Love Roller Dolls and Shoetown Slayers at home in the Doug Ellis Sports Centre, BCU city north campus, Wellhead Lane Perry Barr. More infor on the Facebook event here.